A French prisoner struggles to survive in a Nazi concentration camp during World War II. A delinquent youth is obsessed with a cemetery ghost. Good and evil fight for the soul of a zombie. A grandmother thought to suffer from mental illness predicts the future. A mysterious maintenance man haunts a college dormitory. Car trouble leads to an encounter with an angel. The Greek god of the unknown fights his nemesis, the god of light. A chief must calm a volcano before it destroys his village. A human tries to dissuade elves and dwarves from going to war. A bride confronts deception in an effort to reunite with her bridegroom. A child dreams of an alien invasion. Humanity races to colonize a second moon orbiting the earth. A boy encounters superhuman army ants that escape from a military laboratory and move into his closet. A foreign exchange student learns baseball and tries out for a championship team. 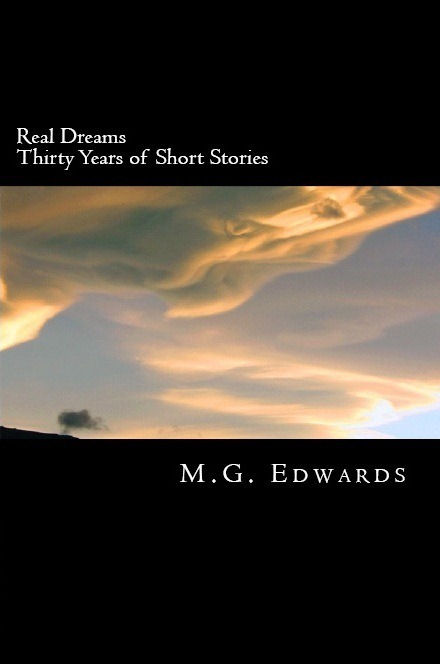 These stories and more are featured in Real Dreams: Thirty Years of Short Stories, a collection of 15 short stories written between 1981 and 2011. The stories are from multiple genres with some common themes, including hope, dreams, light, darkness, perseverance, and spirituality, wrapped up in some novel ideas. Enjoy these diverse and timeless works three decades in the making. Now available to purchase in print at Amazon.com and Createspace. Also available to purchase as an e-book for the Kindle at Amazon.com and for the Nook at Barnes & Noble. To read more books and stories by M.G. Edwards, visit www.mgedwards.com.